The name poet to some it’s a new phenomenon while to others it’s a song that keeps on playing in their minds in times of both joy and sorrow. As one way of saying thank you to these poet fans, Chiphwando Cha Ndakatulo organizers in collaboration with Poetry Association of Malawi (PAM) has organized a thanksgiving show to be held in the commercial capital Blantyre on Sunday, December 13, 2015. The show promises to be one of the best shows ever, will be held at Blantyre Cultural Centre and is dubbed “Ndakatulo m’chakachi”. Speaking in an interview with FaceofMalawi reporter, one of the organizers Blessings Chileuka said the show has been organized to remind fans all their favourite poets in 2015. “We thought of coming up with this show to say thank you to poet addicts for patronizing most of our shows organized across the country since the birth of “Chiphwando Cha Ndakutulo” event,” said Chileuka. “Without their (poets fans) support we could not have been where we are today and we don’t take this for granted,” he added. While promising fireworks, Chileuka urged all poet fans both within Blantyre and outside to come out in large numbers and witness the last show in 2015. Some of the poets to perform at the show include Sylvester Kalizang’oma of “Unkalindanji Moyo,” Samuel Joseph, Raphael Sitima, Joseph Madzedze, Yohane Pangani, Thandie Thole Chikopa and Hudson Chamasowa. The show will also be graced by stand-up comedians; Mada Nyambo, Jacob and Winiko and not forgetting The Mighty GYV dancing crew. The show will also be spiced up by the live performance of one of popular gospel singer whose music has changed lives of many souls in the country Princess Chitsulo. 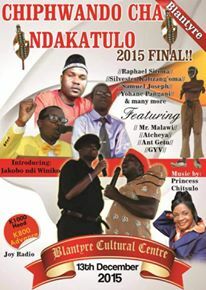 Chiphwando Cha Ndakatulo show was last held in August 2, 2015 at the same venue and the show attracted huge crowd. Meanwhile and advanced tickets are going at MK800 while gate charges its MK1000. how can i upload my poems?